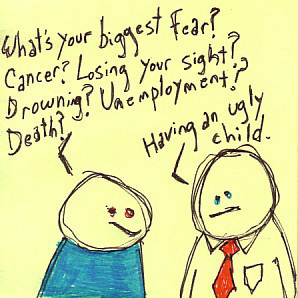 "(person one) What's your biggest fear in life? Cancer? Drowning? Unemployment? Death? (person two) Having an ugly child." Purchase this fun sticky note artwork on eye-cathing clothing, super cool beer steins, sweet buttons for your backpack and much, much more! .